Stella Arnaldo's Blogspot: Whatta joke! RECEIVED this email from a friend who got it from actor/comedian Leo Martinez, director-general of the Film Academy of the Philippines, who wants to know how Carlo J. Caparas, king of local massacre films, made it to the National Artists Awards list. But hey, Malacañang says Lani Mercado is super qualified to become San Miguel board director. 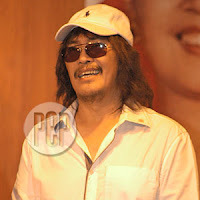 So should we even wonder why Carlo Caparas became a National Artist? Some weeks back, news was rife about the National Artist Awardees awaiting confirmation by Malacañang. Cited as National Artist for Film, albeit posthumously, was Manuel Conde. We at the Film Academy of the Philippines had nominated Director Celso Ad. Castillo, but really, nobody can dispute Mr. Conde’s place in Philippine cinema’s history. We believe that even Director Castillo who is similarly deserving of the award will graciously acknowledge the greatness of the man. Two days ago, the confirmation was finally announced and to our surprise and to the surprise of many in the film industry, the National Artist Award for Film was also conferred on Carlo Caparas. Not only that, he was bestowed the National Artist Award for Film AND Visual Arts. So, where did he come from? Throughout the long and exacting selection process, Carlo Caparas was never ever mentioned as nominee, not for film and surely not for visual arts. All of a sudden, he is a National Artist and seemingly the most gifted of all for straddling two major art fields. There only seems to be one answer to this mystery. Between the Awards selection panels and us, the people, the list of awardees made a stop-over in Malacañang. Someone waved the magic wand and a name appeared, a person who never went through the incisive and deliberate scrutiny that the rest of the awardees were subjected to by the Awards organizers. I believe that this is an act of blatant accommodation. Conferring the highest award on someone who was never in the running makes a travesty of the National Artists Awards, an institution that has been looked up to, venerated even for the recognition it gives to Filipinos whose body of works or whose contribution to the Filipino people is of the highest order. We have as this year’s awardees Manuel Conde for Film and Federico Alcuaz for Visual Arts. Both are commendable, both beyond question. It has never been done before but had the Organizers wanted to give the same award to more than one person, why not consider the other most deserving nominees. Instead, and to our utter disgust, a new category was coined and the two most prestigious awards for Film and Visual Arts were conferred on Carlo Caparas. It is a pity that the National Artist Award has been reduced to a joke. ...o, bakit, di ba, sabi nga ni hellogarcinbn-ztejocjocbolante780Mfertilizerscam macapagal arroyo pwede nga ako, na ako'y isang sinungaling at magnanakaw (not to mention pandak at arrogante atsaka bitchokoy)maging presidente, sila pa? buti nga kayo dyan, first choice ko ay si yoyoy.. buti nalang hari nang massacre movies nalang. There is just no stopping the Arroyo administration in as far as belittling the institutions of the Philippines for the sake of patronage politics. What a shame that majority of the Filipinos seem to have taken a nonchalant attitude towards these approach by Arroyo and her minions. On a positive note, wonderful blog. Keep it up. Thank you Anonymous 8:05 pm. Come back soon.